What is Following Jesus 101? Why Is Satan Tempting Me? Wendy Wonders Why Are We Different? Share this with friends and family! Following Jesus 101 Ministries will help introduce, encourage or regain faith, hope and passion in your personal relationship with Jesus Christ on a daily basis. If you don't know Jesus, need a boost of support or advice about His saving grace, my Blog, Books and Studies promise to be that for you at Wanda-Ball.com! 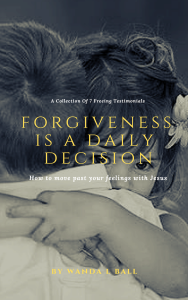 These 7 freeing testimonials about forgiveness were compiled together as a simple resource to help you in your journey of learning how to forgive others who have wronged you, at it's purest form. It's not a feeling, but a decision or call to forgive when you've been hurt, hurt others or oneself as obedience to God! You will also receive updates from me from time to time. No worries... you can unsubscribe at any time! What Does The Bible Say About Being Free? Simply put... making the decision to forgive others releases you from the pain, bitterness and unhappiness that their wrong has created. Forgive for yourself - not them! You'll also receive email updates from time to time. I promise not to bug or spam you. You can unsubscribe at any time.